So…. I did something. 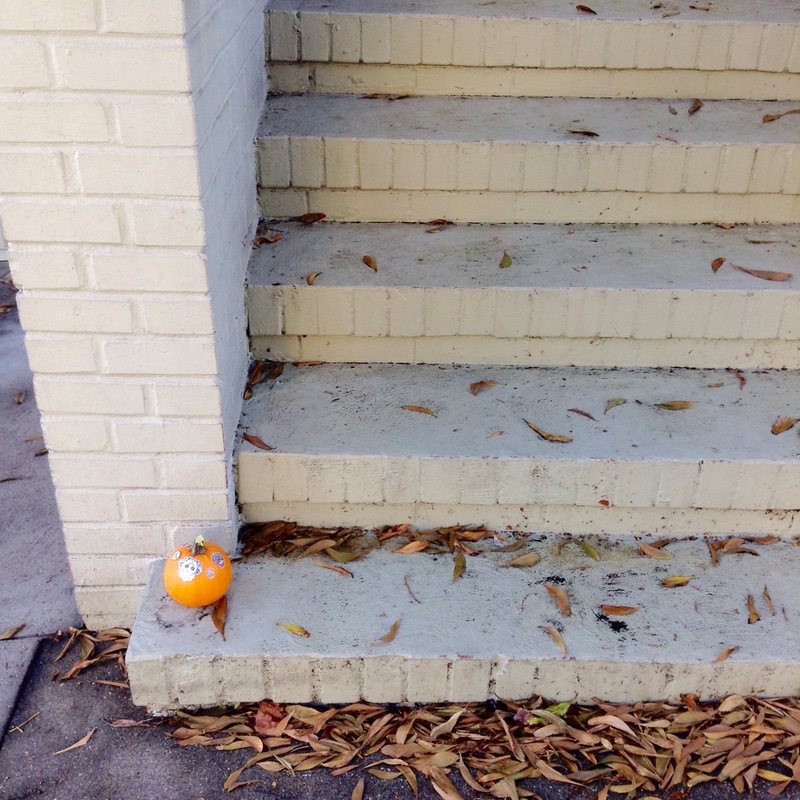 Remember the forlorn pumpkin from yesterday? I spent the day imagining the little kid who made it. He or she must be two or three. You know, too young to carve a pumpkin but old enough to want a pumpkin and to decorate it. There’s a corner store on my walk to work that sells gourds (and Christmas trees, oddly, but that’s a different story) so I decided to get the sad pumpkin a friend. I was super pleased with myself until I arrived at the stoop. The sad little pumpkin was gone! With just a dirt ring to show where it used to be. I think some jerk probably stole it. It’s kind of a busy street like that, in the middle of the city. I was in a quandary. Now my friend pumpkin would be all by itself if I left it. But the poor kid would have no pumpkins if I didn’t. Who am I kidding? I still planned to leave the pumpkin. So I did. My pumpkin replacement slash offering. Complete with stickers. Happy Halloween, kid. 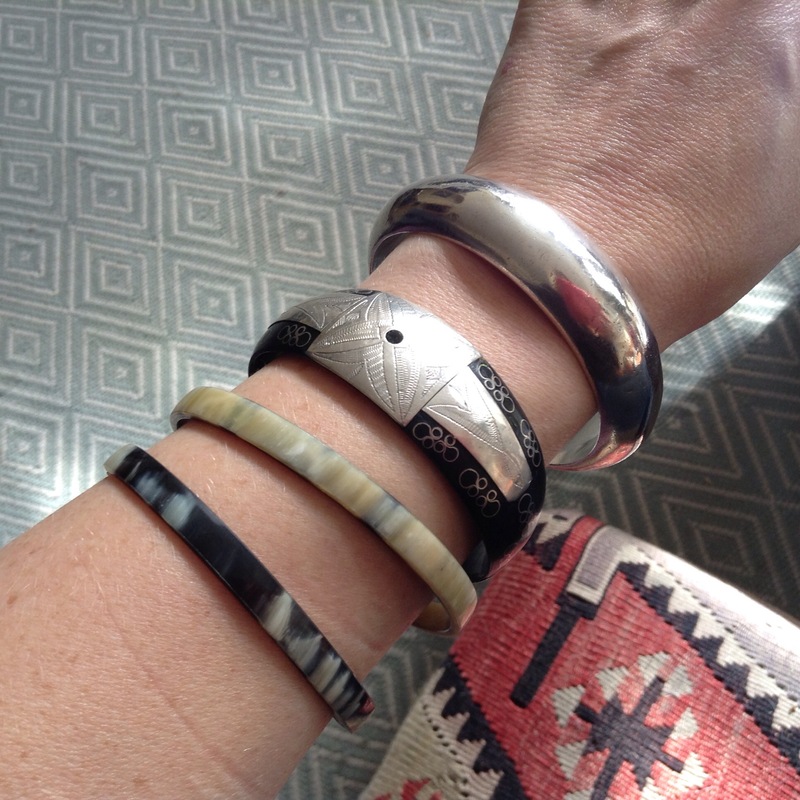 My bracelet’s today are two horn bangles, my silver Tiffany’s bangle from Christmas 1993, and my Tuareg ebony and pounded silver cuff I used to wear everyday in the year 2K. How cool of you!This needs to be written as a short story. I hope you check on the pumpkin sometime. I will check in it! I walk home past it so I’ll see if it’s still there soon. Oh good, keep tabs on that li’l pumpkin. Good news! Pumpkin is still there!